Doctor Who: Revisiting MIDNIGHT | Warped Factor - Words in the Key of Geek. Dr. Moo takes a big space truck with a bunch of strangers across a diamond planet called Midnight. What could possibly go wrong? In this week’s episode of Doctor Who we have the Doctor starring in an episode of Most Haunted LIVE with Donna watching at home. 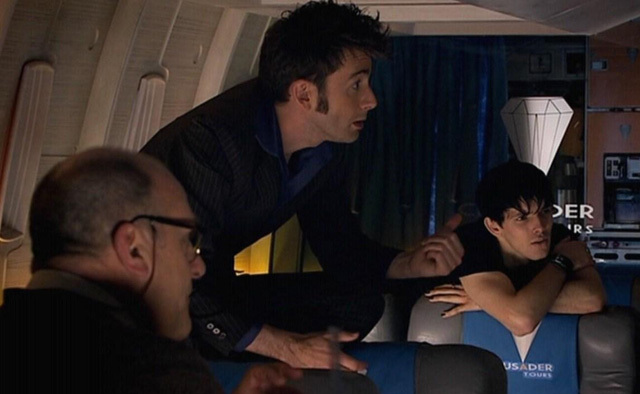 Or at least that's how things initially looked when series four was being made – it doesn’t take a genius to figure out why Russell T Davies threw that idea aside and decided to write a standalone “bottle episode” on the quick to fill its place in the schedule. On paper the result of that would just be a standalone disposable fluff-piece that exists to meet the criteria of filling the schedule and nothing more. In practise we got the best thing Russell T Davies has ever written. For all Midnight’s simplicity and zero thrills setting, the few CGI shots are magnificent. The thing that makes Midnight work so well lies in its simplicity. 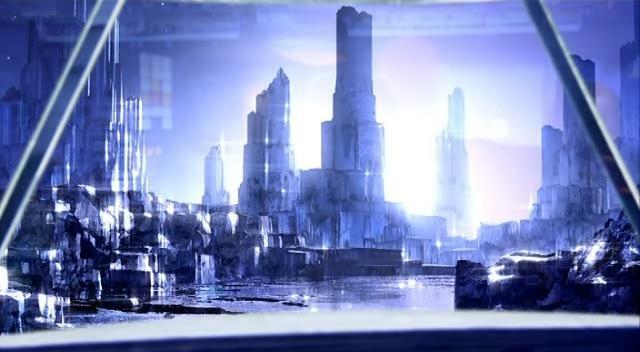 CGI is used only two or three times and only for landscapes or backgrounds. The cast consists of only a handful of people. It’s all set, save for the start and end, in one locked room. The monster is invisible and it appears only in the form of a loud banging sound. Taking that premise and mixing it in with something that we all find irritating – specifically when someone copies everything you say back at you – RTD manages to create something genuinely unsettling. From there Midnight becomes a tense psychological Hitchcock-esque drama. The monster copying every word that the Doctor says is scary enough but the complete lack of trust from his fellow passengers is quite another. Present them with something totally unknown that by all known laws of the universe cannot exist and now threatens to destroy them how do they react? When they all threaten to throw Sky, and later the Doctor, out of the room to a certain death you can believe it without question that this is exactly what they would do. The anger and menace they direct to their victim is worse than anything you get from a Dalek or Cyberman. What does that say about you that you can believe this is their response? What would YOU do if you were on that fateful bus journey? Would you be prepared to kill a fellow passenger? What if it was the only sure way for you to survive, would you then? Could you? Tell me you wouldn’t. If you say you wouldn’t then I don’t believe you, but let’s hope you never have to prove it. Full marks to Russell T Davies for taking the audience out of our comfort zone with such apparent ease. Say what you will about him, believable characters are his forté. Another area in which Midnight excels is in the acting. David Tennant is reliable as usual, that should go without saying, but this may well be one of the best performances he ever gave as the Doctor. He’s not alone in it though; joining him we have a host of memorable guest characters. David Troughton, son of Patrick, is pitch-perfect as arrogant know-it-all Professor Hobbes, a man who refuses to alter his opinion to fit the facts. Lindsay Coulson and Daniel Ryan bring to life Mr and Mrs Cane as the ringleaders of the mob of humans while Colin Morgan plays their believably overlooked son – you can see why he remains a bookies favourite for playing the Doctor in the future (I’m all for it, let’s make that happen). Midnight begs the same question from everyone after watching it: “What the hell just happened? !” But we will never fully know just what it was that got into the bus. To hammer the point home even harder, we don’t even know the name of the person who saves the day – she’s simply know as The Hostess; a nameless figure who just stands there and listens to what’s going on rather than joining the bandwagon. RTD decided not to go overboard with explaining everything because that’s not the point of his script. That’s a good call on his part there. As a rule I like to know everything I can about something, that’s part of why I enjoy my work in physics, but rules are made to be broken occasionally and this is one of those times. We don’t know what creatures call the planet Midnight home but we do know that they’re dangerous and if they ever reached civilisation all hell would break loose. Some have called for a follow-up to this story to find out what was going on; they’ve missed the point completely. The monster is but the secondary villain to the mob mentality of the petty group of irrational humans. Seeing our beloved Doctor left to their mercy is in equal parts astonishing and upsetting. In writing Midnight, RTD achieved a true feat and delivered the single greatest episode ever to have him as the sole writing credit on it. It really draws you in and by the time the credits roll you realise that you’ve just witnessed something quite special. This pushes the boundaries of “family” viewing in ways few shows ever can and it is both repulsing and beautiful at the same time. In short, I can’t praise it enough. Is this really from the same writer who was responsible for the Abzorbaloff??? That’s astounding.